Free Comic Book Day is May 4! Go for the Gold in 2019 at Speeding Bullet! Black Friday deals and Small Business Saturday-Sunday at Speeding Bullet! Celebrate Local Comic Shop Day and Okie Comics on Nov. 17! Fall Monster Sale is Nov. 2-4! Walking Dead Day is Oct. 13! Speeding Bullet Comics Pop Art and Graphic Novel Signing on Oct. 6! Batman Day is Sept. 15! Free Comic Book Day will be held from 10 a.m. to 7 p.m. on May 4 at Speeding Bullet Comics, 614 N Porter Ave. in Norman! Free Comic Book Day, held annually on the first Saturday in May, is a worldwide event in which participating comic book shops across North America and around the world give away selected comic books absolutely free to visiting patrons. And this year “May the Fourth” be with you as we will give away a special Star Wars comic just for the day! We will also have free comics featuring the Justice League, Catwoman and more! Each year hundreds of fans visit the shop, and thousands of comics are given away. Local ‘Spider-Man’ cosplay actors will appear from 10 a.m. to 2 p.m. to sign comics and take pictures with fans. In addition, local comic book creators will appear this year at Speeding Bullet Comics. Author J.O. Young will be on hand to sign her novel “Freaks” from 10 a.m. to 2 p.m. Young is also the writer of the story “Oklahoma Time Quest” in Okie Comics. Artist Hunter Huskey, who with Jerry Bennett was one of the original artists of “The Grave” from our own Matthew Price, will appear from 10 a.m. - 2 p.m. to sign and sketch. Don’t miss one of the biggest comic book celebrations of the year! Find out more at our Facebook event page! The monsters come out this spring! Speeding Bullet’s super-awesome mega-sale starts with a special after-hours preview night on April 5 and runs through April 7. How can you qualify for the sale? There are multiple ways to get a sale wristband! 5. Get one free with any in-store $25 purchase prior to the first day of the sale. The Monster Sale wristband makes you eligible for all the weekend’s savings. Our Spring Monster Sale will feature 50 percent off many back issues and 25 percent off trade paperbacks! During the sale, premium back issues ($25 and up) will be 10 percent off the currently marked price. Plus, all graphic novels will be 25 percent off! (Does not include any graphic novels pre-ordered or in files.) And each day, return for that day’s special discounts! Bonus discount: 50 percent off posters and novelties — magnets, buttons, pins and keychains, for four hours only. Don’t miss this spring’s big savings! As we start a new year at Speeding Bullet Comics, we’d like to offer our regular customers a chance to buy into the third year of a successful program at the store: Speeding Bullet Gold. This program is intended for customers who make frequent use of our services, and want to support the local economy and Speeding Bullet’s role in the community. -	A $50 gift card at Speeding Bullet, good 12 months from date of issue. -	Automatic invites to Speeding Bullet sales and events and early entry in some cases when applicable or possible. - “Gold Days” — Discount days and other events exclusively for Gold members. - Notification of new items, collections and other specials. Sign up by Feb. 2 and get a free, selected graphic novel! Christmas Eve: Open from 10 a.m. - 4 p.m.
New Year’s Eve: Open from 10 a.m. - 4 p.m.
We anticipate being open our regular hours all other days this season; 10 a.m. - 7 p.m. Monday-Saturday and noon-5 p.m. on Sunday. New Comics Day will remain Wednesday with release dates on Dec. 26 and Jan. 2. We’re predicting this is how your holiday season might play out: You methodically plan your wish list, give everyone the greatest gifts you can find … Then you miss out on the item you really wanted! Shop at Speeding Bullet and we’ll save the day. We call it “Bad-Gift” Insurance. 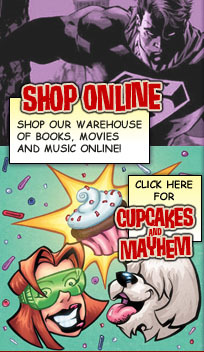 Do your Christmas shopping at Speeding Bullet, or just buy comics like you do every week. With every $50 purchase, we’ll give you a 30% off coupon that you can use on any one item you choose Dec. 26-31. That means you have a whole week after Christmas to get what you really wanted! Of course, if your loved ones are already shopping for you at Speeding Bullet, you win big time, because you can combine those 30% off coupons with your Speeding Bullet gift certificates — available in any denomination! “Bad-Gift” Insurance is available Nov. 16 - Dec. 24. You can collect as many 30% off coupons as you like, but you may only redeem one coupon per item. - Comic Book Sets will be 25 percent off! - Statues will be Buy One Get One Free! - Toys will be Buy Two Get One Free! - Supplies will be 25 percent off! Only time discounted this year! All back issues in the bins priced at $3 or under are just $1! Meet Darren Croy and Allen Grimes of 2i Comics’ “Block of Time” from 11 a.m. - 2 p.m. on Nov. 24! Celebrate Local Comic Shop Day with Speeding Bullet Comics! We will welcome creators from “Okie Comics” #4 and have several LCSD-exclusive items for sale! Kick off your holiday shopping at your local comic shop! Some of the exclusive items set to be released on Local Comic Shop Day are as follows. Reminder, some of the exclusive items are very limited and in many cases Speeding Bullet may only have one copy. Celebrate your local comic shop with Local Comic Shop Day 2018! The monsters come out this fall! Speeding Bullet’s super-awesome mega-sale starts Nov 2 and runs through Nov. 4. 5. Get one free with any in-store $25 purchase from Oct. 24 - Nov. 1. Our Fall Monster Sale will feature 50 percent off many back issues and 25 percent off trade paperbacks! Toys and statues will also be 25 percent off! Spend $100 or more during the sale (after discount) and receive a mystery BONUS BOX full of all kinds of goodies — could include toys, graphic novels, comics or other surprises! Retail price of items included in BONUS BOX is an estimated $50+! We have a big lineup of events for you on Oct. 26-27 to celebrate Halloween and Halloween ComicFest! First, on Oct. 26 is our Halloween ComicFest Preview! From 10 a.m.-noon we will welcome Ben Soto and Justin Soto with their comic “Tricks & Treats” from Halloween Head Comics! All day on Oct. 26-27 any graphic novels in the “horror” category are buy two, get one free! Then, Halloween Comic Fest proper starts on Oct. 27 with giveaways including Hellboy, Spider-Man and more! At 10 a.m. on Oct. 27, we will welcome Christopher Michael Elliott (”The Ominous Adventures of Poppi & Poe” variant cover) to sign, sketch and visit with fans! At noon Oct. 27, Robert Henry and Joe Evans of the horror comic inspired by 1980s films, “Bad Candy” will be signing. This will be the only place to get a special “Bad Candy” exclusive! From noon-3 p.m. meet some of the creative minds behind the upcoming horror/sci-fi film “Shifter,” producer Zachary Burns and writer/director Jacob Leighton Burns! Get a free sticker, and see the teaser trailer for the film! At 2 p.m., we will have as many of our panel of guests as possible for a Q&A! Then at 3 p.m. author J.O. Young of the prose series “Freaks” will sign copies and meet with fans! We may have some additional spooky surprises throughout the day as well! It’s a big two-day extravaganza at Speeding Bullet! Don’t miss it! With The Walking Dead we’ve had 15 years of love, loss, walkers, gore, and top-notch story-telling. To celebrate, Image and Skybound are teaming up with Speeding Bullet and other comic shops around the world to have The Walking Dead Day, Saturday, October 13! First off, to celebrate this insane milestone, there will be a re-print of The Walking Dead #1! Whether you’re a new reader or a super fan, this re-print, featuring an all new cover by Charlie Adlard, is a MUST have! PLUS, in honor of the 15th anniversary of The Walking Dead, 15 of the best artists working in comics were tapped to create new original art for 15 key issues of TWD! These awesome comic book store exclusives won’t be on sale until this Saturday, October 13! So make sure you swing by Speeding Bullet Comics to celebrate The Walking Dead Day with us this weekend! Meet Michael Garrett of Art by MG and Robert Soul, writer of the Set-In-Tulsa graphic novel, Ruined My Rhythm from noon to 3 p.m. on Oct. 6! Talk art and writing with the creators and get original art and graphic novels signed. Rob has acted in several musicals, starring in three, including Esther and the Banquets of Susa, for which he co-wrote the music, lyrics, and the book. His non-fiction articles have appeared in Green Country’s PreviewMagazine and TulsaPets. His short fiction, under the pen name ROBERT SOUL, has appeared in Dark and Dangerous Things III. Maria’s pen and ink sketches always seem to cause things to happen. Six months after a stray bullet from a drive-by kills her mother, she steals from a foster family and leaves town in search of answers and her estranged father. A snarky, intelligent outsider, Maria is hard, edgy and tough, a combination of Lisbeth Salandar, the angry, volatile main character from The Girl with the Dragon Tattoo and cynical, witty, coming-of-age Enid Coleslaw from Daniel Clowes‘ Ghost World. For more information, check out the Facebook event page at https://www.facebook.com/events/411290736067036/. Get a free Batman comic and meet artist Christopher Michael Elliott from 10 a.m. - 7 p.m. on Batman Day 2018, Sept. 15, at Speeding Bullet Comics! Labor Day Sale 2018 at Speeding Bullet Comics! All Labor Day Weekend, starting Saturday Sept. 1, get selected back issues for just $1! On Monday, Sept. 3, Speeding Bullet will be open from just noon - 3 p.m. with more exclusive deals! Speeding Bullet Comics’ 3-hour Labor Day sale will feature buy two, get one free on all graphic novels and trade paperback collections! Also on Monday, for every $50 spent, get a $10 voucher good during the month of September at Speeding Bullet! Select back issues will be 25 cents each on Labor Day! Celebrate with us and these great deals! Back to School Signings with Speeding Bullet! It’s almost time to go back to school, but we won’t let the fun stop at Speeding Bullet! We are celebrating back-to-school with a great lineup of events on Aug. 18. From 10 a.m. to 7 p.m. on Aug. 18, we’ll celebrate the release of Okie Comics #3 and J.O. Young’s “Freaks” with signings, Q&As, specials and more! 10 a.m. - noon: Signing by Okie Comics artist Jessica Garvey! 1 p.m. - 3 p.m.: Signing by “Freaks” author J.O. Young! 3 p.m. - 4 p.m.: Panel discussion with Jessica Garvey, J.O. Young, Jeff Provine and possibly others! 4 p.m. - 6 p.m.: Signing with Okie Comics artist Don Rosencrans and Okie Comics author and creator Jeff Provine! - 25 percent off for teachers! - 10 percent off your purchase with a student ID! - “X-Men” and related graphic novels are buy one, get one free! Find out more and sign up at our Facebook event page! Celebrate 20 years of Speeding Bullet Comics! Speeding Bullet Comics, 614 N. Porter Ave., will celebrate 20 years of serving the Norman community with an anniversary party on July 14. Signings, giveaways, sales and more will mark the occasion. Event hours will be from 10 a.m. to 7 p.m. July 14 at the shop. All Day: 20 percent off all back issues! All Day: Buy two get one free on toys and posters! Spend $50, get a 20th anniversary T-shirt! Enter drawings for prizes all day! Speeding Bullet hopes that this year’s celebration will be even more than meets the eye. “Transformers” fans will want to stop by to have a chat with former Marvel Comics assistant editor and letterer Jim Massara, who worked on Marvel Comics version of the title. Massara is also a veteran animator, penciller and inker. He’ll be on hand from 2 p.m. to 5 p.m. Comic book writer/artist Jerry Bennett will return to Speeding Bullet Comics for the anniversary. Bennett is one of the artists of the comic-book story “The Grave,” written by Speeding Bullet Comics’ Matthew Price. The pilot film based on the Grave screened at this year’s deadCenter Film Festival in Oklahoma City and is on its way to Comic-Con International in San Diego. Bennett has worked on sketch cards for many big licenses in recent years, including “Star Wars” and Marvel Comics. Coming up later this year, he will provide sketch cards for an official “Stranger Things” card set. Bennett will appear from 10 a.m. to 2 p.m. at the shop. Bennett also created the art for the official Speeding Bullet Comics 20th anniversary T-shirt. Kent Clark — in fact, his real name — is also on hand to celebrate 20 years of Speeding Bullet Comics. Clark, whose illustration of “The Grave” was recently featured in Oklahoma Contemporary’s exhibit on local comics, has drawn comic books for Looking Glass Studios, Equinox Comics, Gray Haven Press, and InDELLible Comics. He’s also worked on Marvel Comics characters through the Upper Deck card company. Clark will sign from 4 p.m. to 6 p.m. on July 14. Matthew and his wife Annette, both University of Oklahoma graduates, formed Speeding Bullet Comics in 1998, after purchasing the assets of Millennium Books, which itself had followed the Norman location of The Archives chain of stores. Celebrate the possible nuptials of Batman and Catwoman at Speeding Bullet! Christopher Michael Elliott will be on hand doing sketches and artwork all day long! Have cake! Sign the guestbook! Try to catch the bouquet! It’s the wedding you never thought you’d see! The Batrimony is real as Bruce Wayne and Selina Kyle are set to tie the knot in a can’t-miss, extra-length milestone issue that will reshape Gotham City. All their friends (and a few enemies?) will be party to a comic book coupling for the ages. Superstar scribe Tom King officiates the sure-to-be-offbeat nuptials, joined by an all-star lineup of guest classic Bat-artists doffing their hats to the lucky couple in a series of pre-wedding flashback scenes sure to set the romantic mood. Also check out Catwoman #1 on sale the same day! At Speeding Bullet, check out cool Batman- and comics-related art from Christopher Michael Elliott from 10 a.m. - 7 p.m. on July 4 as part of our Bat-wedding celebration! Sign up at our Facebook event! Free Comic Book Day is May 5! Free Comic Book Day will be held from 10 a.m. to 7 p.m. on May 5 at Speeding Bullet Comics, 614 N Porter Ave. in Norman! Get free comics featuring the Avengers, Supergirl and more! Each year hundreds of fans visit the shop, and thousands of comics are given away. Our local ‘Black Panther’ cosplay actor will appear from 10 a.m. to 2 p.m. to sign comics and take pictures with fans. In addition, several local comic book creators will appear this year at Speeding Bullet Comics. Writer/artist Mario Wytch (”Myth,” “Sasquatch”) will be on hand at Speeding Bullet Comics on Free Comic Book Day with comics and more! Mario is set to debut an all-new comic at this year’s event! Catch him from 10 a.m. until around 4 p.m.! Writer/artist Robert Henry and artist Joe Evans will be on hand from 2 p.m. to 5 p.m. with their “Bad Candy” comic books. Those 12 and under who come to Free Comic Book Day at Speeding Bullet Comics in costume will have a chance to win a special prize package. Find out more at our Facebook event page! Spring Monster Sale is April 6-8! Speeding Bullet’s super-awesome mega-sale starts April 6 and runs through April 8. ‘Rachel Strand’ signing on March 24! Are you ready? Equinox Comics’ Tommy Brownell and Johnnie Johnson hold their first official Norman signing in years for The Chronicles of Rachel Strand. Born a half-vampire, Rachel Strand is blessed with great powers…and cursed with a dark heritage. Choosing to fight the darkness rather than join it, Rachel takes up the Hellrazers to seek out and destroy evil wherever it may be found. These are her stories. These are the Chronicles of Rachel Strand! Speeding Bullet Comics is a sponsor of this year’s Norman Chocolate Festival, presented by the Norman PTA Council. We are going to have a comics-themed pre-celebration of this event on Feb. 7 in store, and one lucky visitor can win a ticket for free chocolate at the Festival, Feb. 10 at Norman North High School! We will debut 200 signed comic books at Wednesday’s event, we’ll have treats available in-store, and local writer/artist Don Rosencrans will sign his comic Doc Crimson from 5 p.m. to 7 p.m.! We’ll open at 10 a.m., so come on by and check out the fun! Go for the Gold in 2018! As we start a new year at Speeding Bullet Comics, we’d like to offer our regular customers a chance to buy into the second year of a successful program at the store. This is intended for customers who make frequent use of our services, and want to support the local economy and Speeding Bullet’s role in the community. - A $50 gift card at Speeding Bullet, good 12 months from date of issue. - Automatic invites to Speeding Bullet sales and events and early entry in some cases when applicable or possible. Sign up by Jan. 18 and get a free, selected graphic novel! Okie Comics signing on Dec. 9! Get a free copy of Okie Comics Magazine as it makes its debut Norman signing, as editor/publisher Jeff Provine will be signing copies from 1 p.m. to 3 p.m. Dec. 9 at Speeding Bullet Comics! Black Friday weekend specials and Enigma Machine #2 signing! The following are specials going on Friday-Sunday at Speeding Bullet Comics while supplies last! On Saturday meet local writer/artist John Eric Osborn, and get the comic book Enigma Machine #2 for the first time in Norman! Enigma Machine #2 makes its Norman debut in a Nov. 25 signing at Speeding Bullet Comics from noon to 3 p.m.! Ex-soldier Aaron Pike receives a cryptic message from his long-lost father, involving him in a tale espionage, deceit, and…robots? Get some ‘Bad Candy’ on Nov. 18! As part of our Local Comic Shop Day celebration on Nov. 18, Robert Henry and crew will host the Norman debut of the “Bad Candy” comic at Speeding Bullet Comics! An official signing will be held from 1 p.m. to 4 p.m. Nov. 18 with the limited edition “Bad Candy” comic. Bad Candy is a comic book in the vein of 80s horror films created by Robert Henry and Joe Evans. Don’t miss your chance to check out this great local comic on Local Comic Shop Day on Nov. 18! Local Comic Shop Day set for Nov. 18! The third annual Local Comic Shop Day® is Saturday November 18, 2017. Get exclusive items and celebrate the local comic shop with this special day all about brick and mortar comic stores. Included in this year’s Local Comic Shop Day will be a special, limited-edition release of the SECRET WEAPONS DELUXE EDITION OVERSIZED HC writen by Academy Award-nominated writer Eric Heisserer (ARRIVAL), originally from Norman! Conceived and implemented by ComicsPRO comic book specialty retailers, LCSD calls attention to locally owned independent comic book specialty stores, celebrating their unique and vital role in being the primary fire-starters of pop culture. Pop Culture begins in your Local Comic Shop! We will have many exclusive items but some are extremely limited! Show up early for the best selection. Halloween ComicFest is Oct. 28! HalloweenComicFest is the celebration of Halloween and comics! The nationwide event takes place in Norman on October 28 at Speeding Bullet Comics! Free Halloween themed comics will be available while supplies last! We’ll have other Halloween-themed activities throughout the day! We will be open from 10 a.m. to 7 p.m. to celebrate the day. The Chilling Adventures of Sabrina: Season Two, Batman: Night of the Monster Men, DC Super Hero Girls, Runaways #1 HCF edition, Darth Maul #1 HCF edition and Thor by Walt Simonson #1! Speeding Bullet is an official host of a Wizard World Welcome Party on Wednesday, Oct. 25 at the store, 614 N Porter Ave. in Norman. Wizard World Oklahoma City will be held Oct. 27-29 at the Cox Convention Center in OKC. Attendees to the Welcome Party could win a pair of passes or a Walking Dead CGC variant! If you want to attend Wizard World, use the code SPEEDING for 20% off your tickets at http://wizardworld.com/comiccon/oklahoma-city. 10 a.m.: Be first in line for free variant comics! Noon-3:30 p.m.: Game Knights Signing! Meet Game Knights co-creators Jessica Garvey and Zachary Sarchet at Speeding Bullet Comics’ pre-Wizard World party, event and signing! Game Knights is co-written by Jessica Garvey and Zachary Sarchet; drawn by Jessica Garvey; and colored by Zachary Sarchet. 6 p.m.: Drawing for fabulous prizes! 7 p.m.-9 p.m. Christophe’s Nightmare Cinema! Join us at Speeding Bullet as Christophe showcases and explains a title from his vault of classic horror films as part of our Wizard World pre-party! Join us for fun and surprises at our Wizard World Welcome Party! Speeding Bullet’s super-awesome mega-sale starts Oct 20 and runs through Oct 22. Have a Slammin’ September at Speeding Bullet! We’ve got 3 big events set for September at Speeding Bullet Comics, and you don’t want to miss any of them! First, kicking off Friday, Sept. 1 and continuing through Monday, Sept. 4 is our second annual Labor Day weekend sale! FRIDAY: Back issues in “the expanse” for just $1! Plus all bin comics priced $1.99 or under are $1! SATURDAY: Back issues in “the expanse” for just $1! - Plus all bin comics $2.99 or under are $1! SUNDAY: Back issues in “the expanse” for just 50 cents! - Plus all bin comics $3.99 or under are $1! MONDAY: Back issues in “the expanse” for just 25 cents! - Plus all bin comics $4.99 or under are $1! Additionally, hundreds of graphic novels will be just $5 all weekend long! Speeding Bullet will host a signing from noon-3 p.m. Sept 9 for James Hostler, the Writer/Creator of ‘The Bobcat’, a Graphic Novel set in 1898 Indian Territory. The protagonist is a Cherokee man named Will Firemaker who is finding out that the Legends and Lore of the Tribe are true. His relationship with ‘The Great Cat’ will lead him to a destiny he never could have imagined. This graphic novel is a Western loaded with Sci-Fi and Fantasy as well as elements of the Supernatural. In celebration of Harley Quinn’s 25th Anniversary, this year the bubbly Super-Villain will take over DC’s annual Batman Day celebration on September 23, 2017. Three comics for Batman Day, including an all-ages title starring Harley Quinn, will be available while supplies last. We will celebrate from 10 a.m. to 7 p.m. on Saturday, Sept. 23! Eric Heisserer to sign at Speeding Bullet! “We are excited to welcome such a successful Normanite back home to celebrate his success,” said Matthew Price, co-owner of Speeding Bullet Comics. Heisserer has joined artists Raul Allen and Patricia Martin for the comic-book miniseries “Secret Weapons,” in which the team leader Livewire and her squad of superhuman outcasts come out of hiding, and on to the frontline of the Valiant Universe’s coming battle against the cybernetic hunter called Rex-O. Characters in “Secret Weapons” have offbeat powers, including being able to talk to birds and making inanimate objects glow. Some of the characters from “Secret Weapons” have their origins in Heisserer’s role-playing past, when he developed characters for a superhero-themed RPG. Speeding Bullet Comics is located at 614 N. Porter Ave. in Norman; for more information, call (405) 360-6866 or visit speedingbulletcomics.com. The Facebook event page can be found at https://www.facebook.com/events/1363822697058820/. Speeding Bullet celebrates 19 years! Celebrate 19 years of Speeding Bullet Comics with sales, sketches, giveaways and more! Current schedule for the 19th anniversary party on July 15 is below! All Day: See Art by Paul Snyder comic-themed display! All Day: 30 percent off back issues under $19! All Day: Buy one get one free on toys and posters! 10 a.m. Meet Artist Jerry Bennett! 10 a.m. Cookies and amazing treats while supplies last! 2 p.m. Meet Don Rosencrans and John Eric Osborn! 3 p.m. Door prize drawing! 4 p.m. Cosplay Contest and photos! 6:45 p.m. Second door prize drawing! Free Comic Book Day is May 6! Free Comic Book Day will be held from 10 a.m. to 7 p.m. on May 6 at Speeding Bullet Comics, 614 N Porter Ave. in Norman! Get free comics featuring Wonder Woman, Guardians of the Galaxy and more! Each year hundreds of fans visit the shop, and thousands of comics are given away. Our local ‘Wonder Woman’ will appear from 10 a.m. to 2 p.m. to sign comics and take pictures with fans. Writer/artist S.A. McClung of Displacements: Oasis will be on hand at Speeding Bullet Comics on Free Comic Book Day doing sketches and selling his comic from 10 a.m. until around 4 p.m.! S.A. is a great guest and a regular at Speeding Bullet’s Free Comic Book Day. We’re glad to welcome him back again this year! Writer/artist Hunter Huskey will also appear at Speeding Bullet Comics! Hunter will be on hand from 10 a.m. to 3 p.m. to sketch and sign copies of his comic-book work, including “The Grave” in “Speeding Bullet Comics Presents.” “The Grave,” illustrated by Huskey and Jerry Bennett, was written and created by Speeding Bullet Comics’ own Matthew Price, and is currently in post-production as a short film/web pilot directed by Kyle Roberts and starring Rett Terrell. Artist Robert Henry will be on hand from 2 p.m. to 5 p.m. Robert plans to have a brand-new “Bad Candy” ashcan and some prints to sell, and will also be sketching and sharing his expertise. Those 12 and under who come to Free Comic Book Day at Speeding Bullet Comics in costume will have a chance to win a special prize package including movie tickets. Speeding Bullet’s super-awesome mega-sale starts April 7 and runs through April 9. Our Spring Monster Sale will feature 50 percent off back issues and 25 percent off trade paperbacks! Two weekend events at Speeding Bullet Comics! Graphic novelist Gina Butler will sign comics from 6 p.m. to 9 p.m. Friday, March 10 here at Speeding Bullet! PLUS, Speeding Bullet will have a special sale on omnibus editions for 3 hours only, and debut a new collection of back issues to celebrate this event as well! But that’s not all we have for the weekend! This Saturday, March 11 from 3 p.m. to 5 p.m., watch Todd Beats as he creates LIVE paintings of superheroes — , i.e. Robert Downey Jr as Iron Man. Chris Evans as Cap, etc! Catch both of these events at Speeding Bullet Comics, 614 N Porter Ave in Norman! Natasha Alterici to sign on Saturday! Writer/artist Natasha Alterici returns to Speeding Bullet Comics to sign her hit comic book Heathen, now from Vault Comics. In the comic, Aydis is a viking, a warrior, an outcast, and a self-proclaimed heathen. Aydis is friend to the talking horse Saga, rescuer of the immortal Valkyrie Brynhild, and battler of demons and fantastic monsters. Aydis is a woman. Born into a time of warfare, suffering, and subjugation of women, she is on a mission to end the oppressive reign of the god-king Odin. Alterici will sign from 3 p.m. to 5 p.m. Saturday, Feb. 25. Don’t miss it!